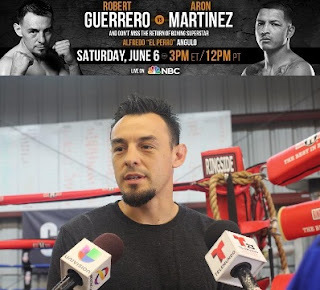 On this edition of No Holds Barred, host Eddie Goldman spoke with boxers Robert Guerrero, Aron Martinez, Dominic Breazeale, and Yasmany Consuegra, who will be featured on the PBC on NBC broadcast this Saturday, June 6. In the main event, the veteran Guerrero (32-3-1, 18 KOs) takes on the underdog Martinez (19-3-1, 4 KOs) in a welterweight bout scheduled for ten rounds. In the co-feature, two unbeaten heavyweight prospects, U.S. Olympian Breazeale (14-0, 13 KOs) and Cuban native Consuegra (17-0, 14 KOs) face off, also in a bout scheduled for ten rounds. This card takes place Saturday, June 6, at the StubHub Center In Carson, California. It will be televised live and for free in the U.S. on NBC, starting at 3 PM EDT/noon PDT. This is the latest card in the Premier Boxing Champions series, which airs on several TV networks. We spoke with Robert Guerrero, Aron Martinez, Dominic Breazeale, and Yasmany Consuegra on a media conference call Tuesday. We also comment on how the PBC series, with some exceptions, has been putting on many competitive match-ups, how they have featured several high-profile upsets and fights which have developed in unexpected ways, how their plan is to build the stars of the future through exposure on free TV rather than through the much smaller audiences watching premium cable networks, and why the PBC cards overall have become must-see television.